A recent National Geographic article fails to portray the commonly used age-determination methods either accurately or objectively. The fact that the readership largely consists of unsuspecting laypeople makes this all the more inexcusable. All dating methods related to the unobservable past rely on unverifiable assumptions, chief of which is the one about closed systems. Furthermore, all dating methods involve the subjective evaluation of data and results, so much so, that their veracity must seriously be questioned. Recent attempts to extend the radiocarbon (14C) dating method back in time provide an instructive example of how age determinations are manipulated. National Geographic magazine (NG), an American periodical, is well known worldwide for its beautiful photographs and outstanding depictions of nations and cultures.1 Owing to its usual excellence, it has been translated into several languages. Unfortunately, and especially so in recent years, National Geographic magazine has increasingly deviated from the subject of geography and become a virtual propaganda mouthpiece for evolutionary speculations. Its pro-evolutionary fanaticism has led to a severe lack of discernment, even extending to pushing frauds, such as the ‘Piltdown Bird’ it called Archaeoraptor, which they claimed (before publishing a far less prominent retraction) as ‘proof’ that dinosaurs evolved into birds—see Archaeoraptor — Phony ‘feathered’ fossil. Many years ago, its promotion of Zinjanthropus boisei as an ‘ape-man’ and even the ‘missing link’ had a great effect on the young (9-yr-old) Carl Wieland. Now even evolutionists have abandoned this creature, now called Paranthropus, as a missing link, but the effect was profound at the time. Later, as an adult and ex-evolutionist, Dr Wieland was determined to produce a magazine as high in outward quality but promoting the truth—hence Creation magazine was born. A recent NG article2 has presented the unsuspecting reader with a totally one-sided and uncritical portrayal of the dating methods used by conventional (uniformitarian) geologists. Evidently, NG is now being pressed into service as a cheerleader for the dogmas of the old Earth and Universe. National Geographic hardly mentions a word about the many dubious assumptions of isotopic dating (see also Q&A: Radiometric Dating). To rectify this situation, I briefly outline here some of the many fallacies of isotopic dating3 and discuss some recent developments in the field of age determination. The NG article lumps all dating methods together, regardless of their assumptions or the span of time supposedly measured by the dating method. Implicitly, it seems there is a deceptive equating of different dating methods. That is, the article discusses forensic entomology, the use of certain insects’ life cycles to help determine how long a human corpse or skeleton had been buried. However, we can follow the insects’ life stages in their entirety. By contrast, dating methods that are alleged to measure geologic events of millions and billions of years clearly depend on unverified and unverifiable assumptions. Who was there when the universe or Earth formed? The Hubble Constant is highlighted in the National Geographic article, and conventionally accepted cosmogonies are presented as proof for the old age of the Universe. Alternate interpretations are not even hinted at, despite many flaws in conventional big bang cosmology. Similarly, the National Geographic article tells the reader that the oldest rock from Earth dates at 4.03 billion years. This is not true. There have been much ‘older’ dates obtained, by various dating methods and from different locations on Earth, some of which exceed 10 billion years. Nevertheless, because the age of the Earth is conventionally accepted at 4.6 billion years, these older ‘dates’ have been ignored or explained away. All dating methods assume a closed system—that no isotopes were gained or lost by the rock since it formed. There is no way of knowing if this was the case. Moreover, whenever dates obtained from rocks are not acceptable to existing geologic theories, the assumptions are suddenly reversed, and we are told that those particular rocks must have become open systems! Obviously, uniformitarian geologists want to have it both ways. Open system behavior has been investigated experimentally by heating igneous rocks. The results have been used to argue that, apart from exceptional situations (where rocks are heated up to at least several hundred degrees Centigrade), it is very difficult for rocks to become open systems. However, we now realize that hydrothermal waters, at temperatures of only a few hundred degrees Centigrade, can readily move chemical species from one rock system to another.5 Even rocks which show no microscopic evidence of alteration often give ‘impossible’ dates, so uniformitarian geologists tell us that these rocks have become open systems—even when independent evidence is completely absent. Conventional (uniformitarian) geologists usually claim that, if dates are consistent, this proves closed systems. But, to begin with, the majority of dates are not consistent for the same rock. Second, the claims about consistency, despite their intuitive appeal, are themselves assumptions, and some of these assumptions have already been proved incorrect. For instance, it had long been supposed that if the data points formed a straight line on an ‘isochron graph’ then the resultant ‘date’ was valid. But now we know that meaningless isochrons can be ‘inherited’ from pre-existing rocks. Furthermore, the points on an isochron can be rotated during subtle open-system events yet still maintain a straight line on the graph. Third, uniformitarian geologists violate their own principle when they reject ‘impossible’ dates even if they are consistent with each other. Charred wood, buried by a basalt lava flow, was 14C-‘dated’ at about 45,000 years old, but the basalt was K-Ar ‘dated’ at 37 million years old. See Radioactive ‘Dating’ in Conflict! The Hawkesbury Sandstone is assigned a Middle Triassic ‘age’ of around 225–230 million, yet it contained fossil wood with 14C activity, although this should be non-existent if the wood were truly more than about 100,000 years old. See Dating Dilemma. Isotopic dates carry a great deal of self-congratulatory baggage. For instance, the NG article mentions uranium-lead dates from zircons as having survived multiple cycles of igneous processes (like bricks can be reused to construct more than one building). But there is usually no independent way of knowing this, and the inherited-zircon rationalization is invoked, after-the-fact, whenever zircons give U-Pb dates that are older than expected for the rock. In other words, instead of questioning the validity of the dating method, uniformitarians tell us that the zircon minerals originally crystallized in some older rock, but had become freed and entrapped in the younger magma, which eventually became their present host igneous rock! Several 20th century andesite lava flows from Mt. Ngauruhoe, New Zealand gave potassium-argon (K-Ar) ‘dates’ from <0.27 to 3.5 million years. See Radioactive dating failure. A 1986 dacite lava dome at Mt St Helens volcano gave a (K-Ar) ‘date’ of method as 0.35 ± 0.5 million years old. See Radio-dating in rubble. I have yet to hear a uniformitarian suggest that this proves that modern lava flows are actually millions to billions of years old! Nor has it been proved that there is a consistent trend between isotopic dates and the relative dates of the fossil-bearing rocks. To evaluate this claim, we would have to see all of the dates obtained (note that most discrepant dates are not published) and these would have to be weighted for the size of the igneous outcrop. Only then could we say whether there is a ‘younging-up’ trend of isotopic dates relative to the claimed progressively younger fossils. And even if such a trend actually exists, it could potentially be explained through geochemical processes without any of the dates themselves being valid age-indicators at all. I now focus on those dating methods which are claimed to give dates from several thousand years to about 1 million years, as these are cited in the National Geographic article, particularly with reference to presumed human evolution. Let us consider attempts to check carbon-14 dates with other supposed indicators of time. It was recently claimed that a count of presumably annual varves at Lake Suigetsu, Japan, agreed with 14C dates to at least 38,000 years before the present.6 Conventional uniformitarian thinking would maintain that this agreement is powerful evidence for the accuracy of the dates: After all, we have agreement between two completely independent dating systems. Furthermore, one of the dating methods does not even require radioactive decay. National Geographic magazine has only presented the positive spin about the dating methods. Of course, it is hardly alone in its rosy portrayal of age-determination methods. Owing to the centrality of the old-Earth dogma in our culture, the maintenance of public belief in dating methods is of the utmost priority. On this basis, it is hardly surprising that the unsuspecting layperson, as well as the innocent child in the classroom, is taught that the dates that are determined by the dating methods are Gospel truth. It is all the more important for creationist scientists to expose the flawed claims of all the presumed methods of age determination, and to get the word out to the general public about this misinformation. My now-late father and I have maintained a subscription to National Geographic for over 30 years. Return to text. Zimmer, C., How old is it? 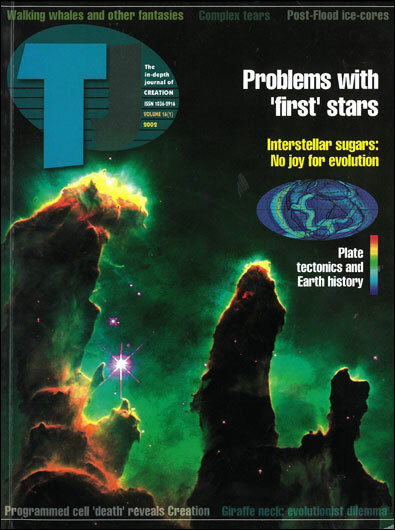 National Geographic 200(3):78–101, 2001. Return to text. Those readers interested in studying the fallacies of isotopic-dating systems in detail should consult my books: Woodmorappe, J., Studies in Flood Geology, 2nd Edition, El Cajon, CA: USA, Institute for Creation Research, 1999; as well as Woodmorappe, J., The Mythology of Modern Dating Methods (top right), El Cajon, CA: USA, Institute for Creation Research, 1999. Return to text. See their chapters in Vardiman, L. Snelling, A.A. and Chaffin, E.F., eds., Radioisotopes and the Age of the Earth (above left), El Cajon, California (Institute for Creation Research) and Missouri (Creation Research Society), 2000. Return to text. For more documentation, Snelling, A.A., Geochemical Processes in Mantle and Crust, ch. 5 in Vardiman et al., Ref. 4. Return to text. Kitagawa, H. and van der Plicht, J., Atmospheric radiocarbon calibration to 45,000 yr B.P. : Late glacial fluctuations and cosmogenic isotope production, Science 279(5354):1187–1190, 20 February 1998; see Figure 1. Return to text. Beck, J.W., et al. Extremely large variations of atmospheric 14C concentration during the last glacial period, Science 292(5526):2453–2458, 29 June 2001; see Fig. 3, p. 2455. Ironically, it was an anti-creationist who brought this paper to my attention (via an intermediary) as proof of how wonderful dating methods are. He shouldn’t have! Return to text. Bard, E., Extending the calibrated radiocarbon record, Science 292(5526):2443–2444, 29 June 2001. Return to text. Beck, Ref. , p. 2454. Return to text.